Rated PG-13 or sequences of sci-fi violence and action. 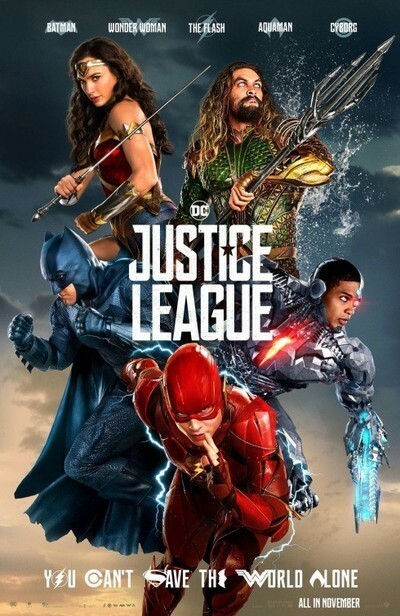 For a film about a band of heroes trying to stop extraterrestrial demon-beasts from wiping out humanity, "Justice League" is light on its feet, sprinting through a super-group's origin story in less than two hours, giving its ensemble lots to do, and mostly avoiding the self-importance that damaged previous entries in this franchise. (Aside from Christopher Nolan's Batman trilogy, "Logan," and a handful of other dark superhero films, excessive moping and brooding tends to be these projects’ undoing.) It’s unfortunate that the film was released on the heels of "Thor: Ragnarok," another knockabout superhero adventure, because critically it will suffer in comparison, even though it chooses a different route toward a similar destination, overcoming daunting production hurdles in the process. “Justice League” never matches the latter film in visual invention, though, and it has basic script problems that never get solved. One is figuring out how to balance the screen time of known quantities from previous entries, such as Batman (Ben Affleck), Wonder Woman (Gal Gadot), Lois Lane (Amy Adams) and Superman (not a spoiler; Henry Cavill’s name is on the poster, folks), against another standard-issue, roaring-and-stomping bad guy (Ciaran Hinds’ Steppenwolf, leader of the Parademons) and three major new characters: The Flash (Ezra Miller), Aquaman (Jason Momoa), and Cyborg (Ray Fisher). The plotline that brings the heroes together is the impending invasion of earth by Steppenwolf, who wants to recover and merge three magic boxes that will give him ultimate power and terraform the planet and blah-de-blah, who cares, seriously, it doesn’t matter. The scenes of Lois and Clark’s reconciliation are brief but sensitively rendered. Almost as moving is the newfound reasonableness of Batman, a miserable loner who seems to have been shocked into sensitivity (at least as much sensitivity as Bruce Wayne is capable of) by the death of Superman, an event for which he assumes primary responsibility. There are moments where you wonder if he's trying to build a team not just to save the planet but to give himself a circle of friends and a reason to check in with them every day. The greying, thickening Affleck is endearing here because he leans into his age, playing up the character's more grievous injuries and making light of the fact that he's not the Bat he used to be. The movie starts by hauling out clichéd elements, including a bleached-out color palette, a funeral in pouring rain, and a mopey, piano-driven version of a dark pop anthem (in this case, Sigrid's cover of Leonard Cohen's "Everybody Knows"). But the BummerVision filmmaking proves to be an aesthetic setup for a worthy payoff: "Justice League" adds wit, invention, color and warmth as it goes along, a strategy befitting a story about characters (and a world) waking up from emotional sleep and learning to take risks and care again. The movie wears its big themes on its sleeves, or breastplates, expressing them via on-the-nose dialogue and brazenly metaphorical images, like the climactic shots of flowers blooming in vivid color and a stirring image of two Amazon warriors, representatives of a society that bears an unimaginable burden, bracing their shoulders against a closing stone door like sisters of Atlas. But that’s what films like this do, just as Westerns and zombie movies and other genre films did before them. “Justice League” is an honorable example of how to work in that mode with skill and a poker face. The inevitable return of Superman is powerful partly because Snyder and company established that his death plunged the world into a haze of despair, superstition, reactionary politics, and revolutionary-flavored violent crime. If the big blue marvel is, as “Batman v. Superman” suggested, something like a god, that means God is temporarily dead when our story begins (his allure smashed into pieces like that giant statue of Kal-El), and therefore can’t watch over us. God's absence means the weaker, meaner, more opportunistic mortals and immortals feel emboldened to do their worst. These aspects of the film are so intriguing that one wishes that they’d been more fully developed, along with the allusions to rising religious fundamentalism and the straightforward equating of Steppenwolf to Satan, a creature of raw chaos and viciousness stepping into a power vacuum. (“Praise to the mother of horrors!” he roars.) But if the film is a potluck stew of half-cooked notions, it's at least a tasty one. Although Ezra Miller’s Jeff Goldblum-like incarnation of the Flash is the most shameless crowd-pleaser, Wonder Woman hooks the film into a belt loop and walks away with it. “Justice League” mishandles the Amazons to give the movie an early jolt of high stakes drama, teases the idea that Batman and Wonder Woman will become a couple (but thankfully doesn’t pursue it), and lets Wonder Woman become an unofficial mommy to the rest of the Justice League, armored men whose competitiveness and wiseguy insults make them seem like overgrown boys, but her character isn't purely reactive, and the filmmakers don't sell her out. Wonder Woman's decency, compassion and moral certitude deliver the same electric charge here that earlier generations got from watching Christopher Reeve play Superman/Clark Kent. Her goodness isn't an act. It's who she is. It’s frustrating to see "Justice League" fail to get out of its own way, because whenever it does, it shrugs off the burdens of its famously troubled production and becomes special. An exact accounting of what went wrong is a matter for an investigative reporter, not a film reviewer, but one would assume that the filmmaking process wasn’t helped by the studio’s sudden, post-“Batman vs. Superman: Dawn of Justice” demand that the story add humor and camaraderie. Ditto the March, 2017 death of director Zack Snyder’s daughter, which put Joss Whedon, who’d already been hired for rewrites, in charge of post-production (including the CGI erasure of a mustache that Cavill grew after he thought the shoot had wrapped—a dubious technical triumph that results in some weird-looking close-ups). The extent of Whedon’s involvement in this rescue operation is anybody's guess. Regardless, the end product is coherent: funny but rarely glib, serious but unpretentious, and better than it had any right to be.